Whether you already love a dark nail look, are looking for something new in your nail designs, or are looking for a nail design for Halloween, these black nail designs offer a number of ideas. While many women may think of dark nails as strictly vampy or goth, black nails can also be versatile and very feminine. A glossy black polish can look bold and beautiful on its own. Pair it with a crystal floral design, and the look is strong yet feminine. The 80s are back in just about every way, from clothes to hair to makeup - why not nail designs? A lacy black design over hot pink polish is a perfectly 80s-style expression of individuality and excess. Black can be toned down by layering other colors and designs over it, such as this gold glitter-dust polish design and creamy white gold flowers. A black nail look like this is elegant for evening. Go a little dark with black nail tips. 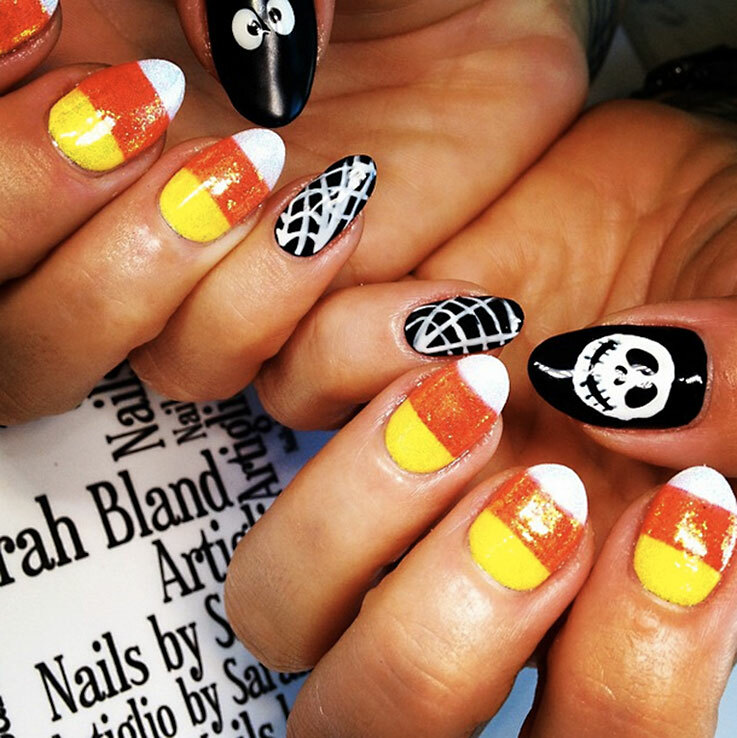 Wear black tips alone for an easy Halloween look, or pair with a simple nail art design in a bright color to keep it lighter. If you don't think 'delicate' and black nail designs can go together, think again. These long, clear acrylic nails look fabulous with a pretty, lacy black nail design and artfully placed crystals. Black and white wedding themes are a popular trend, and brides can even incorporate this look into nail designs for themselves and the wedding party. A glossy black nail with white designs looks fresh and modern. For high impact, use a rich black polish and choose a single nail to highlight with a design. (The ring finger is a popular nail). The green-gold design shown here on the focus nail provides an interesting contrast to the plain black nails. While a simple black manicure looks modern, you don't always have to go for solid-colored nails. Instead, consider a two-toned look with black tips and another color on the base of the nail. Keeping just the tips dark leaves the rest of your nails free for feminine flourishes. Women have enjoyed changing the traditional French manicure into art forms. Instead of white or cream tips, try black tips embellished with glittery details. Do you love the current crackled look in manicures? Use black as one of the crackle polish colors, and it won't dominate your nails. Bright yellow paired with this dark shade brings an unexpected nail look to light. If you love long fingernails that hint at an element of danger, then this look may be your favorite. The bed of the nails remain plain and unadorned, with all of the action focused on the tips. For a crisp, contemporary look that's also a very simple nail art design, polish nails with black polish and bold white tips. Whether you want strong black nails with a sweet touch, or a no-frills dark nail design, there are many creative options when it comes to black polish. Have fun experimenting with your own ideas.